Walmart is our go-to store for almost everything, but it’s now our new destination for affordable workout gear! We were completely stunned when we saw so many fashionable leggings for under $15 and just in time for the new year when we’re hitting the gym non-stop. With plenty of different brands to choose from, Walmart is a treasure trove of quality leggings at unbelievable prices. The Shop With Us team rounded up the best leggings under $15 at Walmart — and we may end up scooping up all of these for ourselves! The Cascade Blue Women’s Active Metallic Splatter Performance Leggings have an elastic band at the waist and a fabric blend that includes spandex for a stretchy, comfortable fit. 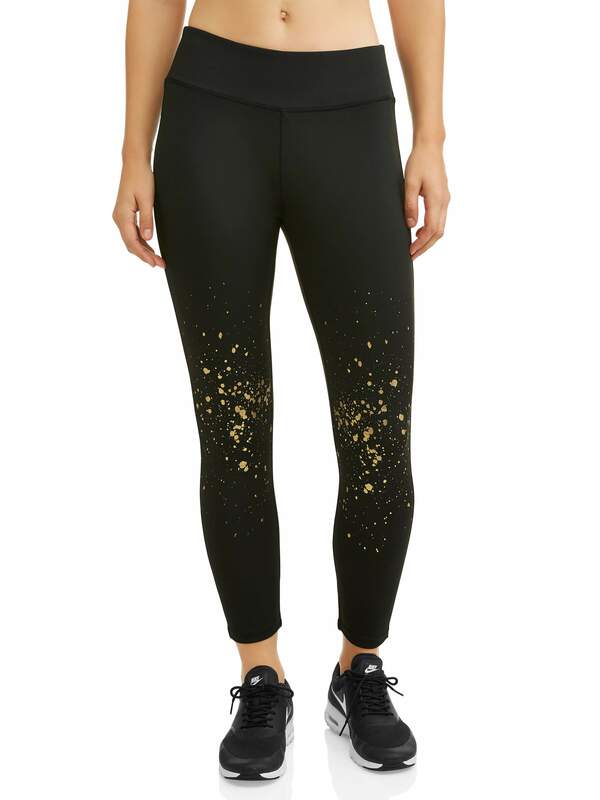 These leggings feature metallic paint splatters. They are available in two styles: Black/Gold and Black/Gunmetal. Sizes range from small to extra large and are available based on the color options. See it: Scoop up the Cascade Blue Women’s Active Metallic Splatter Performance Leggings (marked down 40 percent of its original $15, now $9) while it’s available in two metallic color options. Prefer a different style? Check out all leggings available at Walmart. The Athletic Works Women’s Dri More Core Leggings are made of Dri-Works fabric meant to keep Us dry while we’re working up a sweat while we exercise. But this material is so soft, these leggings are comfortable enough to wear while lounging around the house. We can snag these leggings in three colors including black, gray and blue. Sizes range from small to XXL. These leggings have over 1,000 rave reviews with the majority of shoppers sharing that they appreciate how soft and thick the fabric feels. 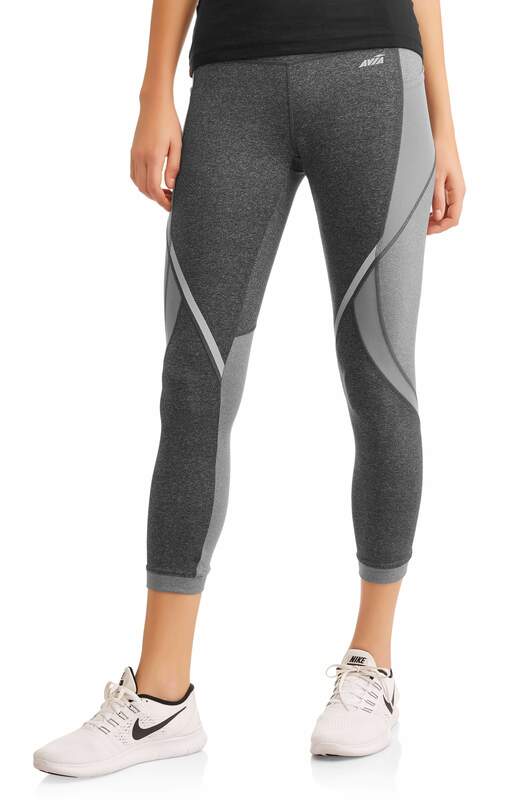 One shopper shared that these are are her go-to leggings for running. Another shopper shared that these were the perfect replacement for a pair of Nike leggings she owned. Several reviewers noted that the leggings run a little small so it’s important to eye the size guide and order up if necessary to get the best fit. See it: Scoop up the Athletic Works Women’s Dri More Core Leggings (marked down 18 percent off its original $11, now $9) while they are available in three colors and so many sizes are in stock. Prefer a different style? Check out all leggings available at Walmart. We’re loving the power mesh details on the Avia Women’s Active Wear Anywhere Mesh Insert Performance Leggings. The fabric blend is also moisture wicking to keep Us dry. These leggings also feature an elastic waistband for extra support in the belly area and a hidden inner pocket for keeping up with keys or cards. The covered elastic waistband features an inner drawstring for added security and has a hidden inner pocket at the waistband that makes carrying your keys easily when you’re on the move. Sizes range from extra small to XXL. The leggings are available in black or teal. Shoppers who already own these pretty workout tights love how chic they are thanks to the different fabric panels. One shopper appreciated how compressive the fabric is. 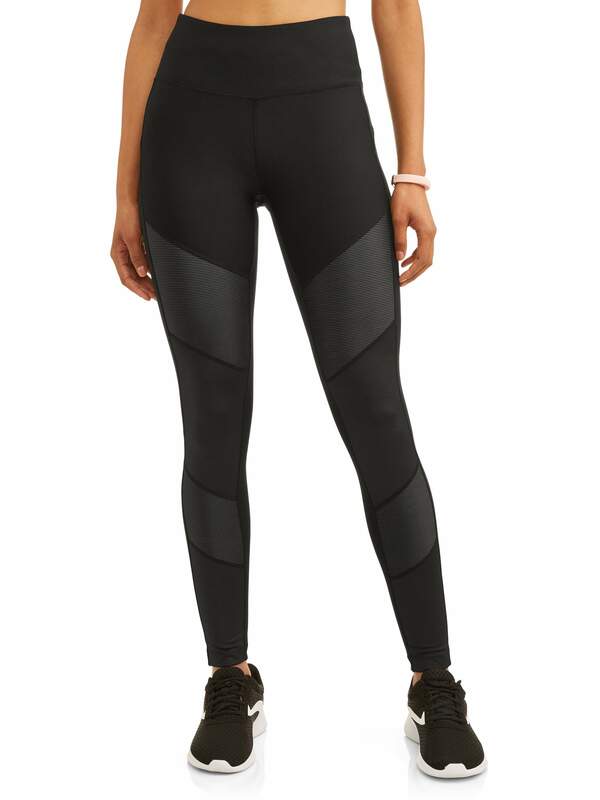 Another reviewer noted no difference between these leggings and the more expensive Lululemon designs she already owns. See it: Scoop up the Avia Women’s Active Wear Anywhere Mesh Insert Performance Leggings (marked down 27 percent off their original $15, now $11) while two colors are available and so many sizes are in stock. Prefer a different style? Check out all leggings available at Walmart. Shoppers who love a cropped ankle design might fall for the Avia Women’s Active Performance 25 Intertwined Crop With Mesh Inserts. These are the perfect pick for showing off our gorgeous sneakers. The leggings include an elastic waistband, power mesh accents, moisture-wicking fabric and an inner drawstring at the waist. We especially love that these leggings have subtle reflective accents that are not only pretty to look at but also great for staying visible while running during the darker early morning hours or in the evening. Sizes range from small to XXL. The leggings are available in two colors which are grey and blue. See it: Scoop up the Avia Women’s Active Performance 25 Intertwined Crop With Mesh Inserts (marked down 93 percent off its original $15, now $1) while it’s available in two colors and so many sizes are in stock. Prefer a different style? Check out all leggings available at Walmart. From leather jackets to ankle boots to leggings, we cannot get enough of the biker chic trend. The moto design of the Avia Women’s Active All Day Moto Shine Performance Leggings is just perfect for adding to our collection! They feature two-tone accordion accents and faux-leather reptile panels that make them great for wearing to the gym or for a casual day out. Shoppers who bought these leggings appreciated the moto-chic style. Several reviewers did note that these leggings run large so it’s important to eye the size guide and order one size down if necessary to get the best fit. Two colors are available including black and grey. Sizes range from extra small to XXL. See it: Scoop up the black Avia Women’s Active All Day Moto Shine Performance Leggings starting at $9! Prefer a different style? Check out all leggings available at Walmart.